Hibs defender Darnell Johnson has returned to training following a spell on the sidelines through injury. The Leicester City youngster has made just one appearance for the Easter Road side since joining on loan during the January transfer window. The 21-year-old was a second-half replacement for David Gray as Hibs went down 2-0 to Celtic at Parkhead. 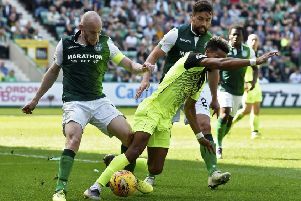 Johnson was later hit with a retrospective two-match ban for a challenge on Hoops defender Emilio Izaguirre. His suspension and subsequent injury left Paul Heckingbottom with just two fit first-team centre-backs in Paul Hanlon and Darren McGregor, with Mark Milligan slotting into the back four for the 2-0 win over Motherwell on March 16 after McGregor was sent off against Rangers in a 1-1 draw earlier this month. American international Jonathan Spector signed a short-term deal to provide back-up in defence, following Efe Ambrose’s departure in January and Ryan Porteous suffering a season-ending injury towards the end of 2018, but the return of Johnson will further boost Hibs’ hopes of carrying on their good run under Heckingbottom with pre-split matches against Livingston on Friday night, Kilmarnock next midweek and Hearts on Saturday April 6.